Looking for some sturdy and secure storage space? Don’t have a huge garden, but would still like to have a decent amount of room to store things? Well the 8′ x 8′ Traditional Standard Apex Shed is going to be able to take care of that for you and it is going to look amazing in your garden as well. This is a very solid shed that offers an ideal amount of space to store many different things. Things like a mower, expensive gardening tools and even kids bikes, toys and anything thing else they like to leave on the lawn can find a home inside here. The door is large enough so you will not have to wrestle with things to get them inside and the large fitted windows let in plenty of sunlight. Very high quality materials have been selected for this shed, but incredibly this has been done without making the price go sky high. Tongue and groove boarding is going to ensure the roof and door are strong and solid. The walls are made from 12 mm tongue and groove shiplap cladding which has a very robust frame standing behind them. 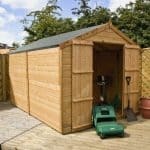 This shed is going to last you many years and keep your garden free of clutter in the process. When you think of a classic design for a shed the 8′ x 8′ Traditional Standard Apex Shed is pretty much it. This does everything you want a good and reliable shed to do and it also has a rather pleasant look to it as well. As the width and the depth are right around the 8 feet mark. 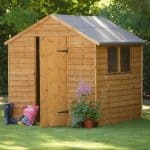 You will find that you have all the storage space you could possibly need with this shed. We are sure you will really enjoy clearing up the garden and maybe even taking some of the clutter from your house and finding a place for it inside of here. The height of the shed is quite impressive as the ridge height is 7 feet 5 inches which will allow you to stand up inside here comfortably. Even at the eaves there is 5 feet 6 inches of headroom which is exactly what we would expect to see from a shed of this size. The apex roof is quite high and this is something we have noticed, Treetops Traditional have done with most of their sheds. We really like this as we mentioned just before it does give you a nice amount of headroom, but also the angle of the roof ensures no rain will sit on top of it. The roof is made with 12 mm tongue and groove boards which can take a lot of weight so even if the snow if heavy, you will not see the roof start to sag like cheaper boards sometimes do. Protecting these boards, Treetops Traditional have used some roofing felt which is going to be able to take anything the weather throws its way. The 12 mm tongue and groove shiplap cladding that makes up the walls is certainly very eye catching. 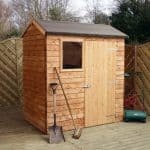 This shed will stand out very well in your garden and the cladding does have a very top quality type of look to it. Of course looking good does not really mean anything if water is going to be finding a way to get in here. Thankfully shiplap cladding is some of the best on the market when it comes to offering protection from rain. The way the boards are together means there is no way for water to sneakily get inside. Treetops Traditional really do use a fantastic frame for their sheds. It is strong and long lasting, but somehow it does not result in the shed being priced high. The frame is 44 mm x 27 mm which will give the shed a very sturdy feel and make sure the whole structure stays firm. One thing that we think Treetops Traditional do not get enough credit for is the rounded edges they give their frames. This really does have a great look and it also helps make the shed be just a little more robust. Just like the roof, the floor makes great use of 12 mm tongue and groove boards. These have a much nicer look than regular solid sheet boarding and the thickness of them will make the floor feel very sturdy when you are moving around inside the shed. We are very confident that this floor is going to be able to take the weight of all kinds of heavy items so do not be afraid to really fill this shed up. The shed will be giving a basecoat treatment for free before it is delivered to you. Once you have installed the shed, you will need to give it a coating of wood treatment within a few weeks. To keep the wood looking good, you will need to give it a fresh coating once a year. We feel that the one year guarantee the 8′ x 8′ Traditional Standard Apex Shed comes with is fair and as the shed is so well designed, you will most likely not have to make use of it. The door on here is just ideal for a shed of this size. When the door is closed the first thing you notice are those three large silver coloured hinges which we can assure you are going to do an incredible job of preventing the door from sagging. The height of the shed is 5 feet 5 inches and the width is 2 feet 6 inches. This will allow you to bring even larger items into the shed without any major hassles. While the door looks great as it is, you can request that the door has a barn style door instead. The shed comes with some great looking horticultural glass fitted windows which are going to let in lots of natural light. When building the shed you will be able to decide which side you would like the windows to be placed on which is something we really do like. If you would like to let some fresh air into the shed then for an extra £31.99, you can change one of them to be an opening window. This is one solid shed and you can see from the picture that the door is secure in part because of those amazing door hinges. But the door actually has a lock and proper door handle on it to make it close securely and be able to be locked up tight. You could even add a pad bolt if you wanted to make things even more secure. The shed windows are large and make it easy to look in, but curtains or blinds would not only look appealing, it would not be much of an expense or any hassle for you to put them in. Or if you want to really make this a structure that offers 100 percent privacy. Then you can request that there be no windows at all. 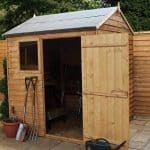 This is a shed which requires you treat it in order to protect the wood and we feel that it would look very interesting if it was given a coat of a wood treatment that is coloured. This would be a fun way to change the look of it a little bit. Treetops Traditional do have a few things which you can add to the shed. If you want to put some larger items in here and are worried about being able to get them in. Then you can upgrade the door to a 4 foot wide double door for a cost of, £53.99. The flooring is already something that is secure, but if you are building this on grass or are just not too sure on the surface you are building this then you may want to consider their wooden floor bearers which are priced at, £43.99. 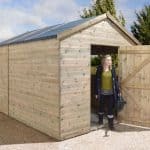 We know that the rather low price may make you think this shed would have cut a few corners here and there, but it is actually high quality all the way through. Annual treatment may sound like a bit of hassle, but actually it is not much work at all and well worth it when you consider by doing so, you are going to get at least 20 years out of this shed. While not the largest shed you will look at, 8 x 8 is just a great amount of storage space that will fit into most gardens. This is rather straightforward when it comes to its construction as long as you follow the instructions, but you will still want to have a friend to help and also a tub of biscuits to keep them motivated. We feel that for the quality and the storage space provided that this is a very good deal. Final Thoughts: No matter what you need the storage space for, the 8' x 8' Traditional Standard Apex Shed is going to serve you very well. We are actually impressed with this shed in pretty much every way. The amount of room inside the shed is more than enough and it does not need a large garden to be installed in. 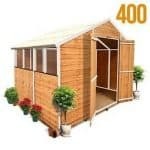 The overall quality of the shed is quite incredible when you consider the price and let’s not forget that this is actually a very attractive building. 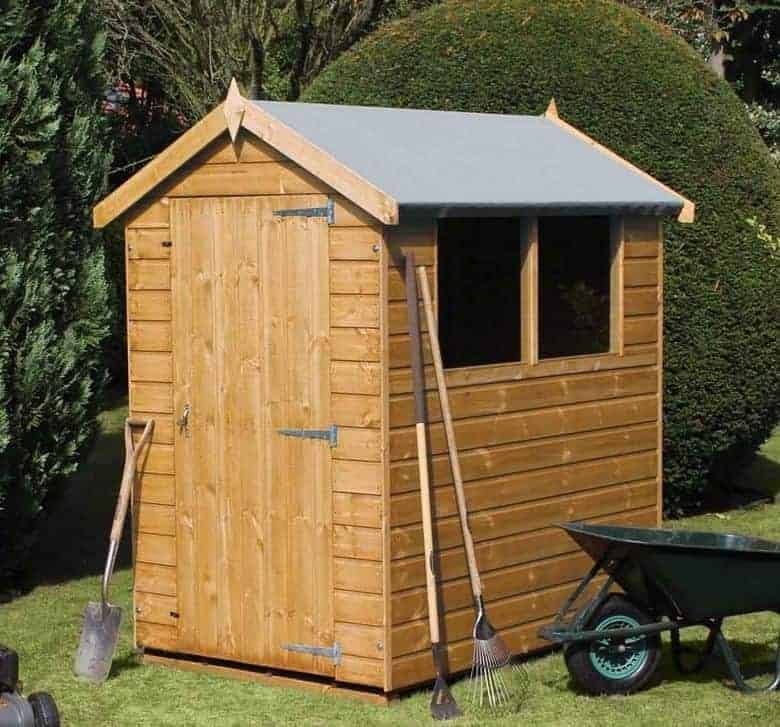 If storage space is the main thing you are after then we highly recommend this shed and are sure you will be happy with it for many years.